So a bit about me and why I have decided to write this ongoing daily blog. I am 53 years old, well in about 35 days I will be and my past has been, let’s say adventurous and sorted to say the least. I am currently married to my 3rd and last husband :-), I have two beautiful daughters each with their own sets of ideas, disabilities and independence and I have two wonderful grandsons that are the absolute light of my life. These two boys ages 4 and 7 keep me going and just let me know that there is goodness out there somewhere even though I’ve had quite a time finding it outside of their two bedroom apartment. 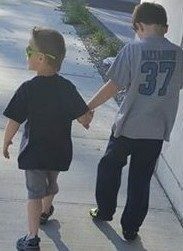 Anyhow, these two boys also have their own struggles in life as my four year old has a terminal illness called Duchenne Muscular Dystrophy and my 7 year old has traits of autism amongst some other behavioral and health issues. My oldest daughter is deaf and partially blind, she was born with a cleft lip and pallet and also with one side of her face growing quicker than the other. After 13 surgeries she said “ya know mom, if folks don’t like me the way I am than they aren’t worth my time” and that was that. My youngest daughter is the mother of my two beautiful grandsons and has enormous health issues of her own, she has been in renal failure twice, on chemo, has continual pleurisy and has been diagnosed with lupus cells but not lupus? really not sure how that happens but okay… she also has what’s called vasculitis so at times, well more recent than not her skin decides to look like a piece of pepperoni pizza and no one can figure that out yet. Not the UW, not the 3 dermatologists, not the rumatoid doctor, not the kidney doctor, hmmm must just be the Pizza skin disorder. She also has severe pain in her legs and is not able to lift her disabled son and she has a slight Mental Disability due to a seizer she had when she was a baby. However she is the best momma on the planet. My youngest daughter above and her boys live within 5 miles of us due to accessibility issues that are frequently needed. I was a diabetic from age three until 9/18/2003 in which I had a pancreas transplant and woke up human, yes I could eat cake and drink soda !!! I have had many many surgeries and health issues and seem to own a hospital room in most states I choose to visit. So now when we travel I just stop in and say hi up front to get it all over with. I have been married to the man of my dreams since April 2, 1994 and God could not have chosen anyone better, this man gives his all for my girls and myself and puts his needs last, his life it seems revolves around just us and the grandsons who idolize him. He never complains, he never rests and he just does what he does to get the things done that are needed. He is also an amazing chef and an actual builder of Rockets among other specialties. So in a nutshell some of my friends along with my two daughters have told me for years that I need to write a book about my life as it would sell like hotcakes because no one would believe it. They would laugh, cry and well just start to drink. Also they have asked that I do this in order for each of them to know the specifics of my past to allow them to gleen how and why I am the way I am. My youngest wants to make sure that her boys know who their gma was and how she grew up and became the gma they know now. So here I am, I have no idea how to even start writing a book, what goes where and who to thank or forwards or back covers or whatever. I have no grammar skills and can only count on spell check. So I have been home from work due to a current health issue thinking…..there is no way I can do this book thing, then I’m laying in bed and it came to me that HEY I think I can blog.. Right? it cant be that hard. Will anyone read it? Will it make a difference? Will anyone care? Then I thought, well who cares, this is for me, my girls and my grandsons so here we are.